VP Plumbing and Heating has been providing quality heating services to our growing customer base since 2009! VP Plumbing& Heating, Suffolk County plumbers, has helped over 100 homeowners switch from oil to natural gas systems. Whether for home or business, natural gas has many uses. It can provide savings and reliability in a variety of applications, such as heating systems, water heaters, gas fireplaces, clothes dryers, and cooking appliances. Please visit our Natural Gas Conversion page for a step by step walk-through of the process. Once you speak with National Grid, let us know so we can walk you through the process of converting to natural gas. If natural gas is not available in your area, give us a call and we can discuss some other options to reduce your reliance on an oil fuel system. We're here to help, so please call 1-516-659-3368 or contact us with any questions you may have. Sometimes referred to as "Forced hot air", forced-air gas heating systems are used in central air heating/cooling systems for houses. In general, they consist of a furnace that is heated by natural gas that forces hot air through duct work and out through vents which in turn provide heat to various rooms within a building. Natural gas is fed to buildings from a main gas line to the furnace. 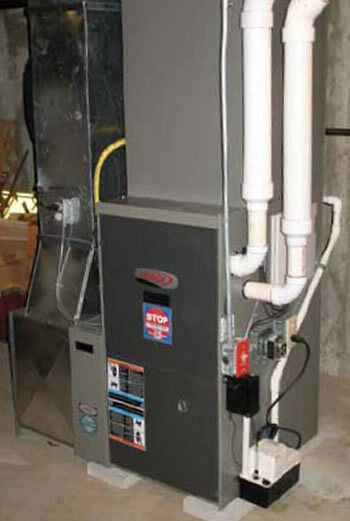 Typically forced air gas furnaces employ a pilot light or a solid state ignition system to light the natural gas burner. The duct work supplying the hot air (and sometimes cool air if an AC unit is tied into the system) can be insulated or not. A thermostat is used to control temperature and will turn on/off the furnace as needed. Digital thermostats give you the ability to program temperature changes throughout the day and night. For example, you may want the heat to turn down to a certain temperature at bedtime and then come back up to temperature 15 minutes before you wake up. 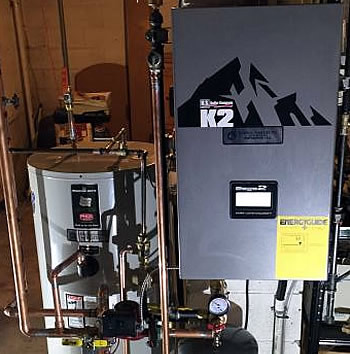 Here at VP Plumbing and Heating we provide installation of gas forced air systems and we can also handle the piping of natural gas to the unit(s) as required to fulfill your heating needs. We're happy to help explain the process to you, just give us a call 1-516-659-3368 or contact us for a free consultation. Designs with underfloor radiant heating had been widespread in China, Korea, Austria, Germany and has become much more common here is the United States. Heating by radiant energy can be used for both indoor and outdoor areas. Radiant flooring is most commonly used in kitchens and bathrooms, entire homes can be heating through the use of radiant heat. 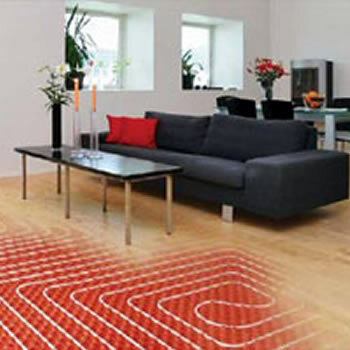 One of the main benefits of radiant heating systems is the decrease in circulation of air inside a room which reduces the spreading of airborne particles. Also with radiant flooring, the surface heats evenly, so you do not end up with any cold spots on your floors. Let VP Plumbing and Heating bring some warmth into your home. Give us a call 1-516-659-3368 or contact us to discuss the benefits of Radiant Heating Systems. The days of big bulky cast iron radiators are no longer common in new construction. Today the most practical and commonly used radiators are forced hot water baseboard style radiators. These radiators are made with copper pipes which have aluminum fins (convectors) which help to increase their surface area. 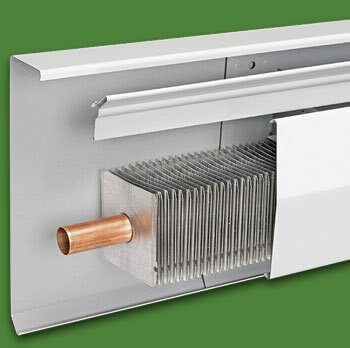 The convectors transfer heat from copper pipes which receive hot water from the heating source. These systems use convection to transfer heat from the radiators to the surrounding air within each room. Cold air is drawn in at the bottom of the radiator, the air is then warmed as it passes over the convectors and heated air is released from the top of the radiator. This creates a convective loop of air movement within the space. Baseboard heating systems typically have movable covers which allow you to adjust the amount of heat that is release from a particular section of the baseboard radiator. We're here to help, just give us a call 1-516-659-3368 or contact us with any questions you may have. VP Plumbing and Heating offers professional gas piping services to residential clients as well as commercial clients. Our vast experience with gas line installations, repairs, and replacements is second to none. We are fully licensed, insured and ready to take on your project. Switching from electrical appliances to gas powered appliances can be a real money saver. 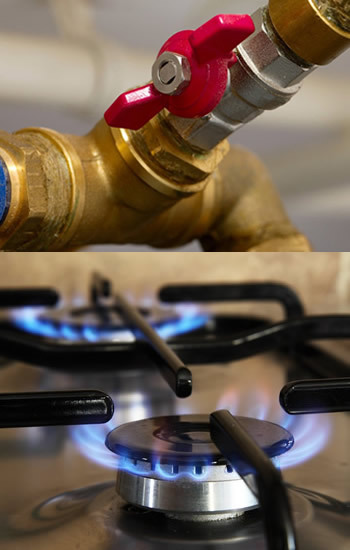 If gas is available in your area, you will need to have new gas lines installed to supply gas to your new appliances. Common gas appliances are stoves, oven ranges, dryers, water heaters, gas grills, gas fireplaces and even gas lamps. Our gas piping services include replacing any electrical appliance with a gas appliance. Gas leak repairs and detection is another import service that we provide. We understand how serious even a minor gas leak can be. If any gas is leaking from your piping, it is important to identify precisely where the problem exists. We have the tools and knowledge to detect such gas leaks and correct the problem before they become even more serious. You can reach us at 1-516-659-3368 or contact us for answers to all your gas piping questions.